I need to talk about my mission. You know how most missionaries come home and all they can talk about for months is how wonderful their mission was? No matter how long a missionary served, they had wonderful experiences that they want to talk about. They want to share funny stories about their companions or talk about amazing conversions they witnessed, just like every other returned missionary. Some people would feel awkward talking to me about my mission, or not even acknowledge that it had happened because they didn’t want to make me feel bad. Give the missionary an opportunity to share their experiences with you if they want to talk about it. Sometimes things relating to missionary work will make me feel really sad. But the opposite is also true. Sometimes the slightest mention of missionary work would cause an unusually hard day. I came home around the start of the big push for member missionary work. I love member missionary work. It’s an important part of my life. But I remember more than one stake conference on the topic that I cried afterwards. Like after any difficult circumstance, sometimes it takes a while for people to be ready to talk about things that remind them of something they have lost. It doesn’t mean that we don’t love the gospel or missionary work. It just means that it hurts to think about it. Sometimes this can be extended to the gospel in general. Many early returned missionaries struggle with reading their scriptures, going to church, or other gospel related activities. Many ERMs feel guilty for coming home, no matter what the reason for coming home was. For me, reading scriptures was so hard because I felt like I didn’t deserve to read them if I couldn’t finish my mission. I didn’t feel worthy to go to church. I didn’t even know how to study the gospel anymore without thinking about how things related to being a missionary and teaching investigators. It took a long time to get back to normal. Just be sensitive to the needs of your missionary. If they want to talk about their mission, let them. If not, save it for another time. In Ye Olden Days (like, a few decades ago before I was born), missionaries would often stay out on their missions unless they were in danger of dying or committed a serious sin. Some of that stigma still exists. Some people assume that if a missionary comes home early, they must have done something terrible. Often, this isn’t the case. Missionaries come home for all kinds of reasons. They come home because they’re sick. They come home because of family concerns. They come home for mental or emotional health issues. Even if the missionary did come home for worthiness issues, it doesn’t mean that they’re a bad person. It means that they have an opportunity to repent and to change their lives. All of these missionaries who come home early have come home after revelation that it was the best option for them and their spiritual, physical, mental, or emotional development. Missionaries that come home early, whether they have made mistakes or not, are still good people, but they worry that you’ll think they aren’t because they came home. Worse, sometimes they will think they are not a good person because they came home. Help them know that this is not the case. Please welcome me like you would welcome any other missionary coming home. By the way, my family rocked at welcoming me home. probably was a chant of “Please tell me you are proud of me. Please be excited to see me.” I didn’t know how people were going to react, and I was worried that those reactions were going to be unpleasant. In fact, I didn’t even know if my whole family was going to be at the airport because I didn’t hear about any of the travel plans. I was just hoping someone would come get me! It’s a silly thing in many ways because you know the welcome home party is not the point of a mission, but when you’re not sure people are going to be glad to see you, it’s hard. If you grow up in the church, you’re used to seeing big parties and welcome home gatherings for returned missionaries, and you wonder if the time you served will even be acknowledged. When I found out I was going home and I was telling some members, one of them said, “Wow! Your family is going to be so glad to see you, though! Seven months is a long time!” I wasn’t sure that he was right. I would have gladly lived the rest of my life in the airport instead of going to see my family. My family did a great job at welcoming me home. There was a big poster and balloons. My sister got me a sister missionary teddy bear. They had a surprise party for me the day after I came home. Their immediate and enthusiastic welcome was very helpful as I started the long road of an early returned missionary. 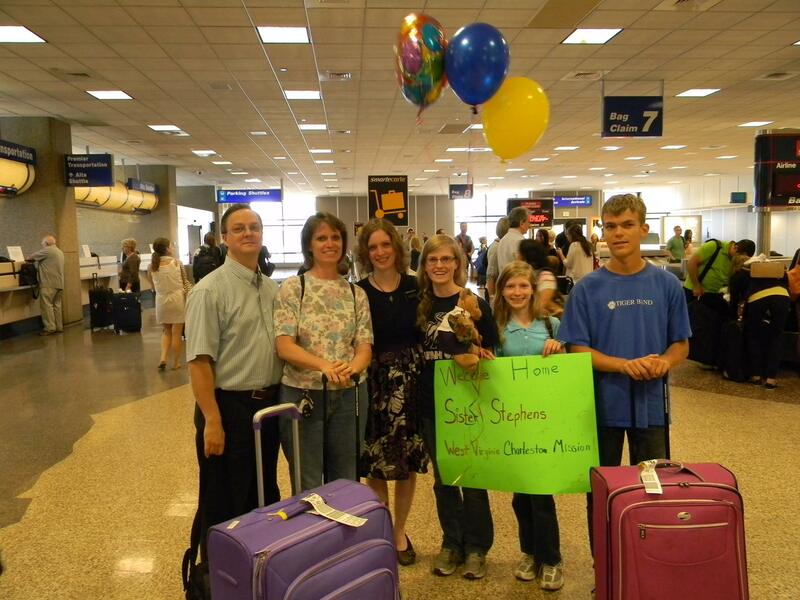 If your missionary served an hour or thousands of hours, welcome them home the same. Sometimes as an early returned missionary I wanted to scream. I wanted to yell something like, “I might seem like I’m fine, but I’m not. I might not have any obvious physical signs to indicate why I’m home, but I have gaping wounds in my heart.” Physically, I wasn’t hurting as much as I had as a missionary. But emotionally, I was devastated. I felt like showing the pain of coming home would be a sign that I hadn’t been a good missionary or that coming home hadn’t been the right thing to do. My sister was also about to leave on her mission, and I didn’t want my pain to get in the way of her joy and excitement about being able to serve the Lord. So I hid it. Most people would think that I was just fine. But I wasn’t. Hiding the pain led to months of agony and depression. When I came home, I was relieved in many ways. I didn’t have to feel like I was in the way of the work because I couldn’t even get out of bed some days. I didn’t have to feel like I was holding back my companions or the ward. I didn’t have to be so sick all the time (or at least I hoped that this would be the case). Many missionaries who come home early could have some amount of relief about coming home. But it still hurts. We expected to come home at a certain time. Everyone expected us to come home at a certain time. But we didn’t. It feels like we failed. Some people might even tell us that we failed. We want to be out serving, but it isn’t the plan. And that hurts. Every mission reunion. The day you would have come home. The anniversary of entering the MTC. The anniversary of coming home. All of these days are incredibly painful. Everyday life is painful. Some days are better than others, but the pain is there. Some missionaries have more of a problem with this than others. Acknowledge that it’s okay to feel sad, and that it won’t hurt this much forever. Like when anyone is going through a hard time, don’t tell them to just “get over it” or that other people have it much worse. Just acknowledge that they’re hurting and do what you can to help relieve that ache. Please don’t ask me about my plans to go back out. This one might seem strange. Isn’t going back out a good thing? Yes. Going back out is a wonderful thing. But that’s not everybody’s story. Every missionary who comes home has to struggle with the decision about returning to the field or staying home. This is a very personal matter between them and the Lord. I know you mean well when you say things like that. I know you are meaning to be hopeful and optimistic, and I really appreciate that you mean well. But when you ask me when I’m coming home, it can make me feel like I have failed and can’t fix that until I go back and finish my mission—even if I know in my heart that my time is done. I love you and respect you, and the thought of disappointing you by saying that it might not be an option for me is hard. I put my heart and soul into what I did while I was a missionary. I did the best I could do. I don’t really know what kind of a missionary I was. I don’t think I can compare myself to Ammon or early church history missionaries. I wasn’t a perfect missionary. I made mistakes. But I did the best that I knew how to do. One of the more hurtful things someone said to me was that if I had been a better missionary I would have been able to stay out on the mission. I don’t know. Maybe there could be some truth to that. When I look back, I see many things that I could have done better. Every missionary has things that they wish they had done differently. But coming home early doesn’t mean that I didn’t love my mission and did the best I could. I had some days that I just didn’t want to be there. I was tired and in pain and sick. There were days that my heart just wasn’t in it. But still, I did the best with my situation as I knew how to do. No matter what kind of mission your missionary served, acknowledge that they tried to do the best they could in their unique situation. Sometimes you can’t help me. This is something that was very difficult for my parents, and possibly a few friends. Sometimes you’re not the one who can help the missionary. Sometimes at the time, there isn’t anyone who can be what your missionary needs to heal. It’s hard to watch someone you love go through something and not know how to help or not be able to help. I couldn’t talk to my parents or friends about what I was experiencing. For me, the relief finally came when I moved to Provo and was able to get a new start. I found myself in a ward that could love me back to being okay again. It took a long time before that happened, though. Before that, I was struggling and no one could really help me. My mom has said more than once since I talked to her about my experiences coming home that she has gained a strong testimony that Heavenly Father loves her children more than she does. I promise that even if you can’t help your missionary, Heavenly Father will. It might feel like an agonizing amount of time before your prayers are answered. But I can promise you as someone who has come out of this situation that Heavenly Father is there. He loves your missionary and He wants them to be happy and healthy. He wants them to know that He accepts their service. I couldn’t see Heavenly Father’s hand in my life at the time. I felt abandoned and like He didn’t care about me anymore. Now, however, I can look back and see that He was constantly there. He knew the best way to help me. I came out of my experiences with a stronger testimony of His love and tender mercies than I think I could have gotten on a mission because I had to fight for my testimony. Trust that Heavenly Father is going to help your missionary in the best way for them. I know that He does. This is the thing that sums up everything I’ve talked about earlier in this post. When I found out I was coming home I knew it was the right thing. But the hardest part was that I was absolutely terrified that people wouldn’t love me anymore. I wasn’t sure how anyone would react. Would the people I loved and respected so much still care about me? I realize now that this was a silly fear. But to be honest, my first Sunday back home was the most terrifying day of my life. Going down the escalator to see my family was almost paralyzing. Coming home was the scariest thing I have ever done in my life. In many ways, it would have been easier to stay on a mission and suffer through the pain than to come home and face people. Let your missionary know that you love them, and that Heavenly Father loves them. They need it. They need you. Coming home early isn’t a trial just for the missionary. It can be difficult for the people in their life as well. I can promise, however, that the people who went through this trial with me have grown and learned so much about Heavenly Father’s love. I would not change what I went through because of the things I learned about His Atonement. You are not alone. He is with you every step of the way. I promise that things will work out. “All things have been done in the wisdom of him who knoweth all things” (2 Nephi 2:24). What do you wish your friends, family, and ward members had known when you came home, or what do you wish you had known when your missionary came home? Note: I want to say to the people who I knew when I came home: you were wonderful. You did so many things to help ease my aching heart without realizing it. I absolutely do not mean to cause any guilt or call anyone to repentance with this post. This is written with the goal to help people surrounding early returned missionaries to know how they can help their missionaries. Thank you so much for sharing that. I really think this will apply to all missionaries, not just the ones that honorably serve a shorter mission. I think so too! I think the principle applies to other situations as well, such as infertility or even being single. I hope this can be applied to many situations and remind us to be sensitive to whatever the people around us are going through. Thanks for reading and commenting!